This month’s Insights puzzle was inspired by a new way to determine the value of the Hubble constant, which quantifies how rapidly the universe is expanding by measuring the distance to a pair of colliding neutron stars. This method opens up the possibility of significantly improving the accuracy of distance measurements to faraway astronomical objects. We recalled that, for centuries, surveyors have used a method called triangulation to calculate the distance to an object without physically traveling to it. This triangulation method, which can still be used for nearby astronomical objects, uses basic trigonometry to produce accurate distance estimates based on angles measured to the object from two different points a known distance apart. This was the basis for our first problem. You are sailing on the ocean and spot a bright light from a lighthouse due south. You sail on an easterly course for 30 nautical miles. You get bearings on the lighthouse again and find that it is now 53.13 degrees south of west. How far was the lighthouse from you when you first spotted it? How far is it from you now? As Ty Rex pointed out, we have to assume plane geometry here because the answers vary with latitude on a spherical surface, especially close to the poles (as readers who know about the famous “color of the bear” puzzle will recognize). This should not be a problem in the middle latitudes of most planet-size objects given the small distances specified. The right-angled triangle formed by the initial and final positions and the lighthouse is similar to the famous (3,4,5) triangle (note that tan 53.13 ~ 4/3), with the path of the boat being on the “3” leg. Hence the initial distance from the lighthouse is 40 nautical miles, and the final distance is 50 nautical miles. The above problem assumes that our measurements of the boat’s traveled distance and our angular bearings on the lighthouse are accurate, which they would be if we used the accurate clocks, speed indicators and theodolites that we have on Earth. However, astronomical distance measurements are affected by several sources of uncertainty, so in our second problem we assumed some uncertainty in the distance and angle measurements, and then tried to figure out how much triangulation helped. Senior Editor Lenny Rudow as he walks through the basic steps on how to triangulate your position on the water when your technology and electronics decide to fail. Using a compass, a pair of parallel rulers, a pencil, a map, and your eyes, these tips will help you to determine your exact position. Let’s revisit the scenario of Problem 1. Assume that you live on a planet on which there is a phenomenon of “optical wind” that causes lensing effects so that you can be sure that your estimates of the direction of an object are accurate only within ±2 degrees. So all you can say is that the lighthouse is somewhere between 2 degrees west of south and 2 degrees east of south. Also, you know (or think you know) how intrinsically bright the source of the light is — it is a “standard candle” — and from this you can infer its distance from you to an accuracy of ±5 percent. Based on this, you can narrow down the area in which this lighthouse is situated. How large is this area? Now suppose you triangulate as before. With the aid of the optical wind, you sail 30 nautical miles (which you can measure accurately, of course) and then again find the lighthouse to be 53.13 degrees south of west, this time with an error of ±2 degrees. You can also infer the distance to the lighthouse with ±5 percent accuracy. By triangulating this new measurement with your previous one, you can narrow down the area in which the lighthouse is situated. How much reduction can you achieve? The original area of uncertainty lies between the two 4-degree sectors of two concentric circles with radii of 38 and 42 nautical miles (a sector of a circle is the portion of a circle bounded by two radii and an arc). It is easy to calculate the difference in area between these two sectors using the formula for the area of a sector, which is simply 1/2r²q, where r is the radius and q the angle in radians. The answer comes out to be 11.17 square nautical miles. As Ty Rex noted, we can approximate this figure by a rectangle centered 40 nm south of the initial boat position. This rectangle has a length of 4 nm and a width of 2.79 nm (2 × 40 × tan 4°), which gives an area of 11.17 square nm and differs from the actual area only in the third decimal place, showing that this simplification is justified. If we do the same thing with the area of uncertainty from the second measurement, we have two overlapping rectangles with common centers tilted from each other at an angle of 53.13 degrees (see figure below). The original rectangle (A) has diagonals 4.88 nm long, whereas the second rectangle (B) has sides of 5 nm and 3.49 nm with the long side falling in almost exactly the same direction as the diagonal of rectangle A in the northeast to southwest direction. This means that the long side of rectangle B completely overlaps this diagonal, but the short side leaves two small triangles uncovered at the northwest and southeast ends of the other diagonal. 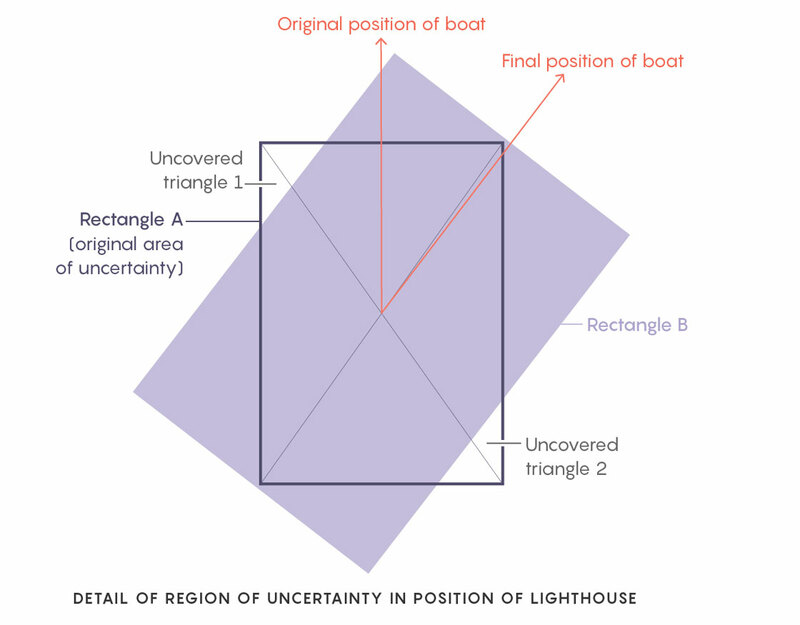 These two uncovered triangles have a combined area of 1.14 square nm in which the location of the lighthouse is excluded, giving an improvement in uncertainty of about 10.2 percent. This is a slight improvement in our knowledge of the location, but certainly not a very dramatic reduction in the area of uncertainty, thanks to the large measurement errors involved. In general, triangulation works best when the distance between the two points used is large and errors in distance estimates and angle measurements are small. In astronomy, the largest distance we can use is the major diameter of Earth’s orbit, which, though huge on terrestrial scales, is much too puny for objects that are light-years away. A far more dramatic reduction in uncertainty is seen in a process analogical to triangulation that is an inbuilt part of how we learn about the world, which I called “cognitive triangulation.” In cognitive triangulation, we pay special attention when the same answer emerges from two independent methods, strengthening the conclusions of both and reinforcing our faith in the reliability of our conclusions. This is a process that has helped us build the entire edifice of scientific knowledge. One way all of us use cognitive triangulation to learn about the world is by comparing and integrating the information coming from two different sense modalities. This leads to our third question. What does cognitive triangulation between sense modalities have to do with motion sickness? Many commenters accurately described the proximate cause for this as the cognitive dissonance between the information coming from the sense organs in the inner ear (the semicircular canals) and the eyes, and some even described how you can lessen or avoid motion sickness. When experiencing motion sickness on, say a ship, you are feeling the intense failure of your body and brain to triangulate your physical position and its movement using the sensors in your inner ear which are effectively an accelerometer and your vision — two separate mechanisms which should produce the same measurement. If you are observing primarily your surroundings on the ship itself — say in a stateroom — they will disagree. Your eyes show you to be still and your inner ear tells you you are moving because the ship is. This dissonance produces motion sickness. If you follow the well known advice to look to the horizon your vision will now confirm the entire ship to be moving as your balance mechanism knows, and the two systems more nearly agree, reducing the discomfort. Drivers in cars trend to be less sick than passengers because the driver has additional feedback from his control of the wheel and throttle and is more likely to be visually focused at a greater distance, also reducing the body’s feedback dissonance. This is accurate, but why does cognitive dissonance induce nausea and vomiting? What, in the language of philosophers and evolutionary biologists, is the ultimate cause? As Anurag Reddy first mentioned, this reaction is hypothesized to take place because the brain “assumes” that the body has been poisoned. In fact, the vomiting in motion sickness is induced by the same area of the brain — the chemoreceptor trigger zone in the medulla — that causes vomiting in response to poisons. This response has probably been programmed by evolution: If two normally reliable sensory systems of the brain give information that is drastically different, in the absence of trauma or illness, it is probable that one of them, or both, are malfunctioning. In the past, when there were no warning labels on foods, and no toxicology databases to consult, one of the most common reasons for this was likely the unwitting ingestion of unknown poisons. If the symptoms were severe, the only chance of being saved would have been to expel as much of the as yet unabsorbed poison as possible. Hence, when the brain believes the body has been poisoned, it is programmed to try to eject all the contents of the gastrointestinal tract as soon as it can. It may make you even more miserable, but if you were poisoned, it could very well save your life. If not, it’s just a temporary discomfort. Recall how many times you’ve been sick in response to food poisoning even with today’s food-safety regulations. This response has probably saved millions of lives throughout evolutionary history. But can’t the brain distinguish between motion sickness and poisoning? Such an ability could evolve, but motion sickness has only become common with the relatively recent advent of high-speed travel. A rewiring change in the brain to distinguish motion sickness from poisoning would only be fixed in evolution if there was an appreciable advantage in survival or fertility for people who could distinguish between the two. Considering that motion sickness is rarely, if ever, fatal, this could take many hundreds of thousands of generations. Meanwhile, it’s always a great evolutionary strategy for our brains to imagine the worst and protect us from it, so we seem to be stuck with motion sickness for the foreseeable future. Thank you for all your interesting comments. Besides the comments referenced above, I enjoyed reading about the personal experiences and the cognitive triangulation “aha!” moments of readers such as Ty Rex, Randy Tompson and Jonathan J.